Two women were treated for injuries and sent home from the hospital yesterday following an accident at the intersection of Denarau Road in Nadi. The accident involved a collision between a 12-wheeler truck and a Land Cruiser. A Police report said the accident occurred when the traffic light was flickering amber. The truck was driven by a 27-year-old man who is said to have been questioned by Police. On the Land Cruiser, the vehicle was driven by a 39-year-old woman, who had a 34-year-old woman passenger. The Land Cruiser landed on its side however the two occupants were safely removed by the by-standers. Fiji Roads Authority says the matter is currently being investigated. 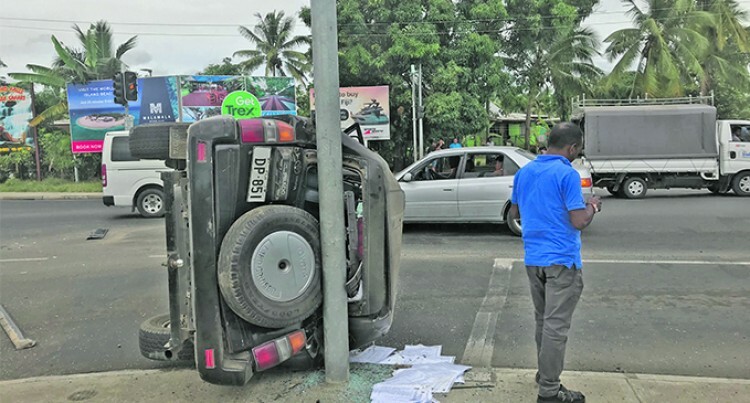 Meanwhile, in a separate incident at the Nadi Back Road, two men were also treated at the hospital after the vehicle they were travelling on veered off the road and landed on its side.